Foremost School junior bullrider William Barrows seen here riding at provincials in Ponoka in early June where he earned a spot at nationals in Wyoming in a couple weeks. 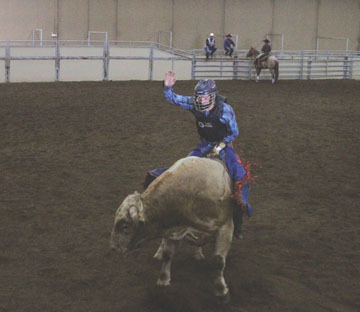 Grade 11 Foremost School student William Barrows rode his bull to perfection as he was able to place fourth in a field of 22 bull riders at the High School Rodeo provincials in early June in Ponoka, securing him a spot in the National High School Rodeo Association (NHSRA) coming up in Wyoming. “I thought I had a few good rides put together,” he said. Barrows, who also participated in the steer riding competition at the Calgary Stampede, will be one of 1,650 contestants from 43 states, five Canadian provinces, Australia and Mexico that will compete in the NHSRA’s world largest rodeo and vying for more than $200,000 in prizes and $350,000 in college scholarships, while having the chance to being named a World Champion. “Just don’t over think it,” he said. He added that he takes pointers from other bull riders, while hopefully practicing twice a week in the winter time and in the summer every weekend at the rodeos. “A lot of it is training the mind to react when you’re on the bull,” said Barrows. He is planning to soak in the whole experience and come home with a scholarship. The 70th edition of the NHSRA with go from July 15-21 in Rock Springs, Wyo.